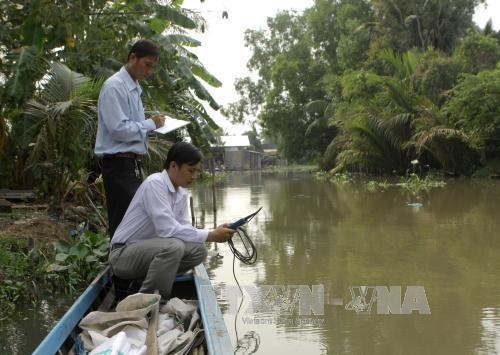 CỬU LONG DELTA — The Southern Institute of Water Resources Research has asked farmers and irrigation management units in the Cửu Long (Mekong) Delta region to store water in ponds and canals for the dry season this year. The institute said they should monitor the weather, the volume of water resources and saline intrusion, as well as use water more efficiently. If water sources are unstable, farmers should not start the summer-autumn crop in certain areas, it recommended. From now to the end of the dry season, many sites in the Mekong Delta are expected to have a low amount of rainfall. Salinity in the Vàm Cỏ River has reached 1.73 per cent, an increase of 0.45 per cent compared to the same period last year. Salinity in Cái Lớn River has reached 2.53 per cent, an increase of 0.5 per cent compared to the same period last year. A report from the institute shows that, from the beginning of the dry season, saline intrusion had penetrated 58km inland in the western coastal area and the Cái Lớn River area, an increase of 6km compared to the same period last year. The institute forecasts that from now to the end of April, water sources in the area more than 30km from the sea and near the mouth of the Cửu Long River will be sufficient for the upcoming summer-autumn crop. But the areas 20-30km away from the sea will be at risk of salinity damage. People living in these areas should have solutions to store water and wait for the rain to start the crop, according to the institute. For the Vàm Cỏ River area, saline intrusion may appear more often and may last until May, according to the institute. The southern region has entered the dry season, with the peak hot weather occurring from March to May.